Custom printing on the front portion of the table cover. 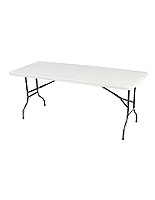 Features white elastic cloth to easily fit into any standard size 6' tables. Open back design leaves room for sitting or placing accessories or boxes. Anti-wrinkle and easy-to-set-up for use in any special events or tradeshows. 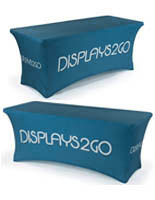 A white stretch cover, table cover plays an important role on your promotions for every exhibit you attend. 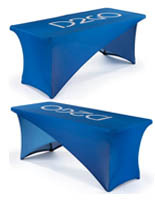 This one-piece table cover is made from Poly-flex material that covers all 3-sides of the display table. Each white stretch cover is made to fit snugly over a 6ft. table with no pins or clips needed. 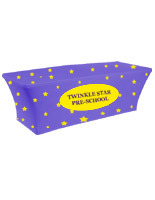 Stretchy cover can be easily set up in just seconds! A table cover, like tradeshow linens and table cloths, is wrinkle-resistant to keep your table top display looking great. Designed with an open back, this white stretch cover provides easy under-table storage access and allows staff members to sit behind the table for a professional presentation. Make full use of all objects, including your table, to sell your services, products or company's name at your next convention. 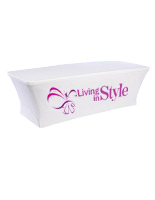 Print your company logo, slogans and campaigns on this white stretch cover. 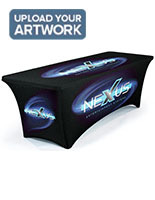 The attractive table cover can draw attendees' attention to your company messages at job fairs, tradeshows, meetings or special events. 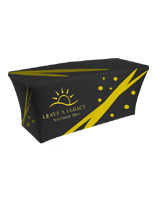 Make an impact on visitors with this table cover. 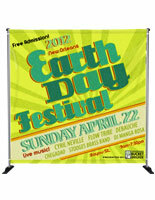 The tradeshow linen, table cover is also available for 8 foot tables as well. 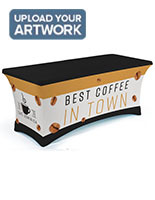 Add a professional look to your display table with this table cover today. Note: Cover is white, and printing is on the front only.